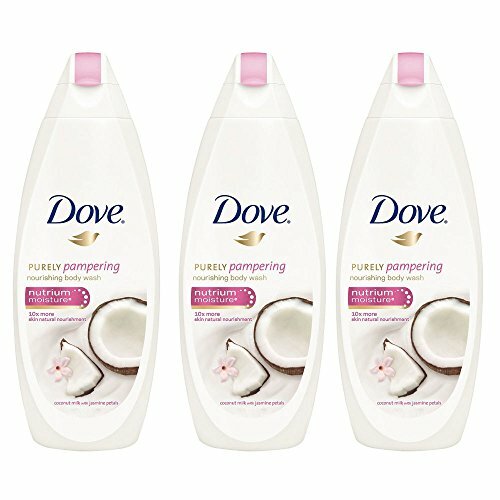 Dove Purely Pampering Coconut Milk with Jasmine Petals Body Wash combines gentle cleansers and Dove's unique Nutrium Moisture technology skin natural nutrients with a delicate coconut milk and jasmine scent to help you pamper yourself for a few moments each day. This Dove body wash is moisturizing, mild and helps your skin to maintain its natural moisture as you wash, leaving you with softer, smoother skin after just one shower. Purely Pampering: treat yourself and your skin every day. Dove Purely Pampering is a range of skin cleansing products designed to nourish your skin and pamper your senses every single day. With a blend of wholesome, skin-loving ingredients, the rich lather and warm scents create a pampering experience that will leave you and your skin feeling balanced and renewed. For best results, simply squeeze onto a shower pouf or hands and enjoy the calming fragrance and rich lather of this moisturizing body wash before rinsing away with warm water. Use this Dove body wash daily to experience a moment of pampering every day. At Dove, our vision is of a world where beauty is a source of confidence, and not anxiety. So, we are on a mission to help the next generation of women develop a positive relationship with the way they look - helping them raise their self-esteem and realize their full potential.